According to the indefatigable Maike Hickson of OnePeterFive, Cardinal Caffarra cherished no illusions about the Dubia Cardinals’ prospects. “The situation becomes (sic) from bad to worse,” he told that journalist, who was also his personal friend. “As everybody knows, the Holy Father has not even granted an audience! It remains only prayers to Holy Virgin of Fatima.” With the one hundredth anniversary of the culmination of the Portuguese apparitions--and the providentially connected founding of Father Maximilian’s Militia Immaculatae movement--approaching quickly in the middle of October 2017, we find ourselves required most urgently by the Almighty to entrust everything, as Cardinal Caffarra recommends, into the Blessed Mother’s immaculate hands. But we must not overlook the fact that His Eminence chose to focus our attention in a decidedly literary direction as well. The Ballad of the White Horse by G. K. Chesterton tells the story of King Alfred the Great of England, who withstood the invading Danes during the societal and religious perils of the ninth century. By genre an epic poem, the Ballad--as aptly characterized by Cardinal Caffarra-- is a “great poetic meditation on an historical fact.” While mixing in literary allusion, philosophical precision, and sheer imaginative insight as only a genius such as Chesterton might be able to accomplish, our Ballad author nevertheless presents us with a protagonist who factually existed. As the “last man standing” in his besieged little kingdom in the south of Great Britain, the historical Alfred did lead a military force to unexpected victory in the existentially and religiously decisive Battle of Ethandune (anno domini 878). “Alfred has come down to us in the best way (that is by national legends),” explains Chesterton himself in his Prefatory Note, “solely for the same reason as Arthur and Roland and the other giants of that darkness, because he fought for the Christian civilization against the heathen darkness.” By calling the Ballad to our attention during the Dubia crisis of our own day, Cardinal Caffarra is telling us something crucial not only about the forces we are being called upon to fight, but also about the way in which it will imminently become necessary to fight them. The Ballad starts out, significantly enough, with despair. At the moment we first meet our hero, Alfred is at his worst, and with good cause. His enemies the Danes have overtaken pretty much everything except the little kingdom where Alfred, styled as the new Arthur, still reigns, and are threatening to overrun it as well. Already, Alfred has engaged the pagan destroyers militarily, and lost; he has bargained with them economically, and been betrayed; he has done all that lies within his power, but to no avail. Having reached the limit of his strength and resources, Alfred retreats to the isle of Athelney, where Chesterton describes him as “broken to the knee.” It is then and there that the protagonist of the Ballad is visited by the Virgin Mary, with whom he converses after all merely earthly forms of encounter have exhausted themselves in capitulation and defeat. And Alfred, having “hardened his heart with hope” (thus meriting miraculous intervention), understands. There is no guarantee of victory, if he fights; there is only the guarantee of intolerable servitude (in this life and the next) if he does not. 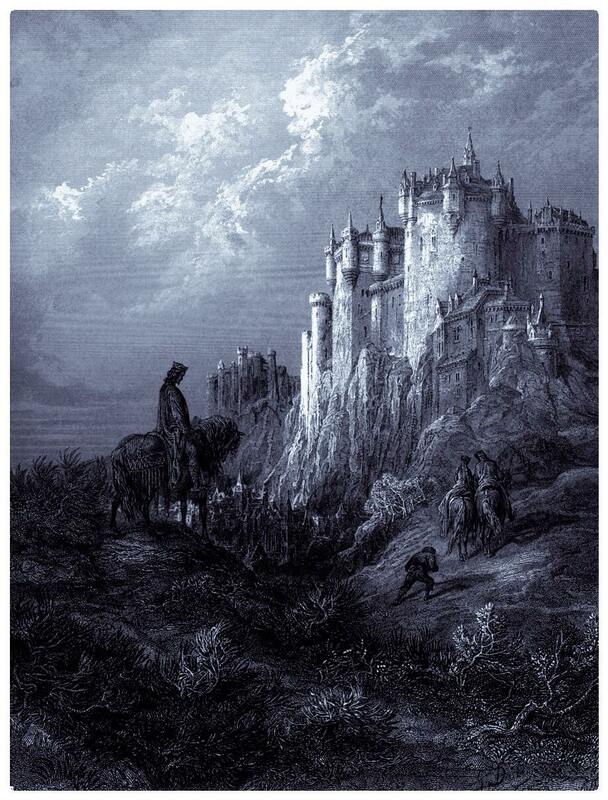 Relying henceforth on Heavenly help rather than his own not inconsiderable abilities, Alfred proceeds to round up the leaders he needs in order to face the formidable Guthrum, ruler of the Danes, on the fields of Ethandune. Mary, while disappearing from the immediate scene, is understood to remain with Her consecrated hero no matter what. As Chesterton tells it, Alfred’s ensuing military victory is fraught with both sociological and spiritual significance. The opening stanzas of Book VII (“Ethandune: The Last Charge”) are arguably the most sublime, providing an “eagle’s eye view” of the events unfolding down on earth in much the same way that the first verses of the Holy Gospel according to St. John provide for the Sacred Scriptures themselves. But it is to the content of Book VIII that Cardinal Caffarra has directed our attention especially. Chesterton symmetrically places his Ballad between “bookends,” with the Marian apparition recounted at the outset counterbalanced by Alfred’s prophetic vision described in detail towards the poem’s conclusion. Just as the Immaculata will not abandon Alfred personally, neither will She ever abandon the People of God whom he symbolically “rules . . . to the end.” And boy, are they ever going to need Her! That they ruin and make dark. To what extended images has our attention been called specifically, and therefore what dots could this Dubia Cardinal be intending us to connect? Our best clue is that the poetic “vision” which captured Cardinal Caffarra’s imagination is found in the Ballad of the White Horse Book VIII, entitled by Chesterton, “The Scouring of the Horse.” In order to understand what is meant by the slightly archaic gerund scouring here, we have to take a moment to consider what, exactly, the titular White Horse refers to. In Great Britain there is a literal horse; in fact, there are more than one. The horse with which the Ballad of the White Horse is concerned is the ancient earthwork found to this day in England’s Berkshire Vale. What poetic use was made of “the Scouring of the Horse” by Chesterton, then, and why would Cardinal Caffarra have been meditating on this use especially? Alfred, in fact, makes the meaning of the weeding quite explicit: “Over our white souls also, wild heresies and high wave prouder than the plumes of grass, and sadder than their sigh.” His Eminence did not live to see the “Filial Correction” of Pope Francis published in mid-September, 2017--a step not taken in the Catholic Church since the White Horse of Berkshire Vale was, relatively speaking, still but a snorting colt. Yet this Dubia signatory here unmistakably implies that “heresy” is what we are dealing with in the age of Amoris--heresy that needs to be uprooted from our own souls first, as broken-to-the-knee Marian instruments, before we undertake to do battle on the fields of the modern-day Ethandune which stretch before us on every side. The unmistakable sense of Cardinal Caffarra’s Chestertonian allusion is that there lies a battle before us--a battle entailing both military and spiritual aspects, and one which is not encompassed by, although it is certainly premised upon, our Christian responsibility to see to the sanctifying of our own souls primarily. That may be where our obligations begin, the Cardinal is to be understood as telling us; but it is not where they end. Nearly overrun though we are, it is still our responsibility to harden our own hearts with hope in the New Eve under whose banner we are meant not only to fight, but also to conquer. The Ballad was first published in 1911. Therefore, unless by a direct inspiration of the Holy Spirit, there could have been no immediate (from the standpoint of 2017) political message in Alfred’s stated intention of making his “fences tough,” nor in the mid-vision reference to the leader of the neo-Danish forces as “one blind idiot, world obeyed, too blind to be abhorred.” Yet these immediately-applicable messages still stand. And if Cardinal Caffarra is to be considered any kind of authority on the subject, they stand providentially rather than accidentally, and are not to be ignored. “Pope Francis: ‘My Advice is Always, ‘Dialogue, Dialogue, Dialogue,’” on Radio Vaticana (http://www.news.va/en/news/pope-francis-my-advice-is-always-dialogue-dialogue; posted July 7, 2013; accessed Sept. 23, 2017). Hickson, Maike, “Some Personal Reflections on the Late Cardinal Caffarra,” on OnePeterFive (https://onepeterfive.com/some-personal-reflections-on-the-late-cardinal-caffarra; posted Sept. 6, 2017; accessed Sept. 23, 2017). All following quotations and observations attributed to Cardinal Caffarra in this article also derive from this source. Chesterton, Gilbert Keith. The Ballad of the White Horse. (New York: John Lane Company, 1911; now in the public domain). In a “full disclosure” moment, this author states that she has been involved with an independent film production of the Ballad of the White Horse begun in 2012 and soon to be released. The opinions expressed in this article are exclusively the author’s own, however, and do not necessarily reflect the literary, theological, or other views held by anyone else associated with the project. Chesterton, G. K. The Ballad of the White Horse, Book I, “The Vision of the King.” The Ballad is broken into eight such Books. The whiteness of the Horse represents not only the primordial and essential goodness of creation itself, but also the ascendancy of that Christian perfection which constitutes goodness’ sole guarantor. Pope Bergoglio calls the building of defensive walls “unChristian,” but neither King Alfred the Great, a saint of the Catholic Church, nor G.K. Chesterton, whose cause is up for canonization, evidently thought so. See “”Pope Suggests Trump is Not Christian,” by Daniel Burke, CNN Religion Editor, on CNN online (http://www.cnn.com/2016/02/18/politics/pope-francis-trump-christian-wall/index.html,posted Feb. 18, 2016; accessed Sept. 24, 2017). The “blindness” of Bergoglio is called to mind by the reticence of the Filial Correction signers to attribute personal culpability to the man; whether he realizes or not that what he is teaching and allowing to spread through the Church on his papal watch is contrary to the Deposit of Faith is a question they pointedly leave aside for the moment. (Realization would render Bergoglio a formal rather than merely a material heretic. That pertinacity is not alleged at the present time does not exclude, however, its potential demonstration in the future.) Literarily, it is doubtful whether the word Chesterton chooses to identify the figure of the “new Guthrum,” leader of the neo-Danes--namely, as an idiot--would have carried the same connotation close to the beginning of the twentieth century as it does now. If we were to call someone an idiot, our phraseology would constitute a pure insult and nothing more. But probably Chesterton intends the term to convey something closer to its etymological sense; in other words, a person who bases his viewpoint on his own thoughts and opinions. In terms of rampant self-referentiality--quoting himself, providing footnotes to his own prior publications, basing the whole of the Amoris “paradigm shift” on the bedrock of his personal and private “sincerity” (Amoris laetitia no. 308)--Pope Bergoglio may be characterized outstandingly, in the basic sense of the word, and apart from any pejorative overtone, as idiotic. In Aim Higher: Spiritual and Marian Reflections of St. Maximilian Kolbe (Libertyville, IL: Marytown Press, Second Printing 2007), p. 21. Helen M. Weir is a freelance writer who holds a Master's Degree in Theology from the Franciscan University of Steubenville. She belongs to the Militia Immaculatae movement of Total Marian Consecration founded by St. Maximilian Kolbe, the Hero of Auschwitz.